Samesun Venice Beach v Los Angeles, USA: Zarezervujte nyní! This is Venice Beach, guys! So you are going to need somewhere suitably eclectic and energetic to stay if you are going to experience it right. This is that place. Sitting right on the boardwalk, the view over the Pacific Ocean in front is, frankly, to die for. What's more, nightly activities make it easy to meet new people - perfect for solo travellers. You can arrange trips to all the attractions around LA, like Universal Studios and Disneyland, from the desk. The beach, a bar and beautiful views are what you get when you stay with us! Located directly on the Venice Beach Boardwalk and close to LAX, we are the best and most convenient spot for exploring LA's beaches and beyond! 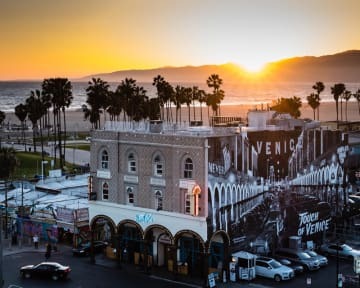 Iconic Venice Beach is world renown and we're right in the heart of it. Many of our dorms and privates have a full or partial ocean view, but you can also just walk out the door and be on the beach in 30 seconds. And after you've had a day of sunning, swimming or just people watching, come hang out in our Surfside Bar & Grill, with our guests getting to enjoy happy hour drink prices all day. We've something happening daily with Trivia Night, Open Mic and live bands in the bar, as well as a limo tour and other activities. And if hanging at the beach is not enough, our knowledgeable local staff can fill you in on what to do both at the beach and in L.A. We're surrounded by places to shop, eat and relax and are just a short bike ride or walk from most of the sites you'll know from the movies including Muscle Beach, our famous Venice Skate Park and the Santa Monica Pier. So grab a bike, board or wave and come chill with us in the California setting you've always dreamed of! **Listed prices do not include taxes. A 14% city/hotel tax will be added at check in. **A valid passport or out of county ID will be required for check in. **Private rooms with shared bath include a sink, hairdryer and towels. These rooms do not have an ocean view. Great hostel located right next to the Venice beach. Clean room, very comfortable bed and amazing view! Only things I could complain about are: 1) common room is quite small and doesn't have any large table where you could socialize with other people 2)the staff was not very enthusiastic - didn't tell me anything about their daily events when I checked in and couldn't provide any recommendations on what to visit in LA. Those are just minor things though, the hostel is a very good place to stay! We are the only hostel right on and right in the heart of Venice Beach. Our fun and social environment reflects this iconic California neighborhood which is quite possibly the best place in Los Angeles. Wake up to ocean views in our en suite rooms and enjoy all that Southern California has to offer while staying with us.